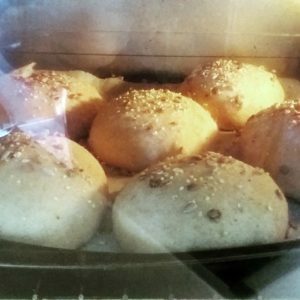 When I have time I try to make sourdough bread loaves and rolls and everyone loves these sourdough spelt seeded rolls. Not only is sourdough more easily digested than yeasted breads, but it also has a delicious fuller flavour too. These rolls are great for weekday lunchboxes, but the dough can also be used to make a loaf of bread in either a 2lb loaf tin or using a baking cloche (or casserole dish). I split the dough into either 6 or 8 rolls and these are rather large, if you have smaller appetites or are making for children I’d split in to 12 rolls. The night before (or at least 8 hours before) you intend to bake mix 100g refreshed sourdough starter with 400ml warm water and 150g of the spelt flour. Leave covered in a warm place. Once nice and bubbly the following morning mix in the remaining 325g spelt flour and 7g salt. Knead the dough until it comes together, but don’t over knead the bread. This is quite a wet dough and you will find it easier to work with wet hands rather than floured hands. Return to an oiled bowl and leave to rise for 1.5-2 hours. Gently knock the dough down and form into rolls (or a loaf). Leave to rise until the dough has doubled in size, keeping them covered. Before baking use a brush and brush the olive oil over the top of the rolls and sprinkle with the seed mix. Bake for 10 minutes and then drop the temperature to 190c/375f/gas mark 5 for a further 10-15 minutes. You can tell when the rolls or loaf is ready by tapping on the bottom and listening for a hollow sound. These will keep well in the breadbin for up to 3 days or they can be frozen. Thank you for giving a very clear, understandable sourdough starter recipe and sourdough bread recipe. I will definitely be making these sourdough bread rolls.